For rent: 2-3 bedroom home, no pets, security deposit, carport, basement, $500 month. 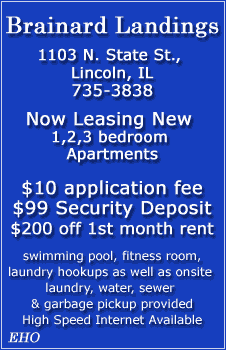 Call 217-638-6051 or 732-4793. For rent in Atlanta, Ill.: 2-bedroom, one-bath ranch-style house. Eat-in kitchen. Utilities not included. W/D hookups. Large yard. $600 deposit, $600 month. 618-513-9319.